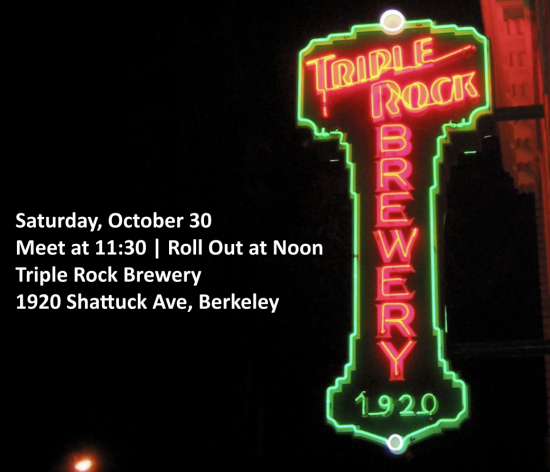 This month we’ll be heading to the East Bay to visit Triple Rock in Berkeley. They’re one of the first brewpubs in the US and earlier this month scooped up a set of medals at the Great America Beer Festival. Prior to drinking their offerings, we’ll be riding the Berkeley Hills. The ride will be hillier than usual, but we’ve also shortened it to 20 miles. If the weather holds up, expect some challenging climbs paired with some outstanding views of the bay. As usual I would encourage everyone to take public transit over to Triple Rock. It’s conveniently located three blocks away from the Downtown Berkeley BART station. Right now there’s a 40% change of rain on the 30th. Keep a lookout on this site and our twitter feed (@thegrandcru) in case the ride gets rained out. The weather gods have been good to the Cru in the past, as we’ve never had to cancel due to weather. I’m hoping we can maintain the streak. P.S. If you’re one to plan ahead, next month’s ride will be on Saturday, November 13 in conjunction with the Bistro’s 5th Annual West Coast Barrel Aged Beer Fest.